For me, today is the second best day of the Christmas season. We have a family birthday on the 30th of November so in respect to the birthday celebrations so close to the festive season we hold off decorating, playing Christmas music or doing anything Christmasy until the first of December. I actually got in trouble for buying the Christmas Issue of Canadian Living on the 29th, though the person who caught me happened to be wearing Christmas socks at the time. 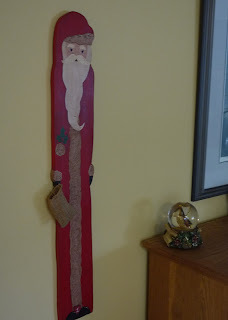 The first order of business this morning was to take down the Aztec Calendar (turns out it's only good for one more year anyway), and replace it with the beautiful Advent Santa my talented sister-in-law made for me many years ago. It's hard to get a photo that will do it justice since you have to stand far away to get it all in the shot. As strange as it seems, when the kids were young, it was a treat to hear them argue over whose turn it was to put the next little red wooden heart on the nail. Now that we're all adults, everyone takes a turn and we've gotten along fairly well up to now. With lots going on this week, we won't be doing much indoor decorating until the weekend, but we do have our Christmas lights ready to be lit this evening. I so very much look forward to returning home to their welcoming glow. This is so beautiful! I showed my son and he said, "Really cool!" I bet he'd be fighting all of you to put on the day's token!! !